Hobee’s has been around since 1974, serving healthy, award-winning food in the Silicon Valley. They are probably most famous for their delicious blueberry-filled coffee cake. 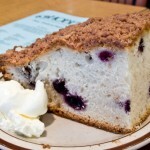 Hobee’s Coffee Cake – This copycat recipe is for Hobee’s famous blueberry-filled coffee cake. – Cake Ingredients:: Flour ((unbleached, sifted)), Sugar ((granulated)), Baking Powder, Baking Soda, Salt, Eggs, Sour Cream, Vanilla, Blueberries ((fresh, optional) (or other fruit, or nuts such as walnuts)), Vegetable Oil, Topping Ingredients:: Sugar ((granulated)), Butter, Cinnamon ((ground)), Preheat oven to 350 degrees F.; In a large mixing bowl, resift sifted flour with baking power, baking soda, salt and about 1 cup of sugar. ; In a separate bowl, beat together the Eggs, sour cream and vanilla. ; Add Egg mixture to flour mixture and beat until smooth. ; Oil a 9-inch square baking pan (you can also use an 8 inch square pan, or anything of similar surface area, if you increase the baking time by about 5 minutes). ; Spread the batter in the pan. If you are using fruit or nuts, scatter them over the batter and stir a little bit so that they stay in the top layer. ; In a small bowl, mix about 5 Tbsp sugar with the butter and cinnamon with a sturdy fork, until they are blended and resemble cornmeal (i. e. , you should have a mixture of fine crumbs, not a smooth mixture). ; Sprinkle topping over batter. ; Bake for 20-25 minutes, until a clean toothpick inserted in the center of the cake comes out dry. ; Cool slightly; serve warm or at room temperature. ; – You might want to double the amount of blueberries. Enjoy! This copycat recipe is for Hobee's famous blueberry-filled coffee cake. In a large mixing bowl, resift sifted flour with baking power, baking soda, salt and about 1 cup of sugar. In a separate bowl, beat together the Eggs, sour cream and vanilla. Add Egg mixture to flour mixture and beat until smooth. Oil a 9-inch square baking pan (you can also use an 8 inch square pan, or anything of similar surface area, if you increase the baking time by about 5 minutes). Spread the batter in the pan. If you are using fruit or nuts, scatter them over the batter and stir a little bit so that they stay in the top layer. In a small bowl, mix about 5 Tbsp sugar with the butter and cinnamon with a sturdy fork, until they are blended and resemble cornmeal (i. e. , you should have a mixture of fine crumbs, not a smooth mixture). Bake for 20-25 minutes, until a clean toothpick inserted in the center of the cake comes out dry. Cool slightly; serve warm or at room temperature. You might want to double the amount of blueberries. Enjoy!